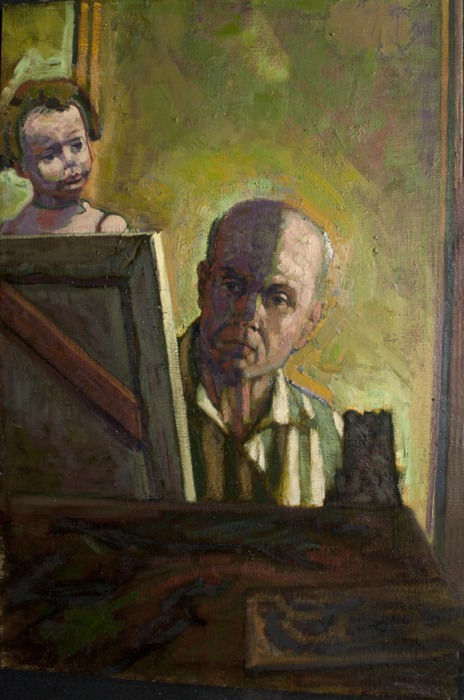 Dominic Cretara, "Self-Portrait with Doll," 2011, Oil on Canvas, 36" x 24" Domenic Cretara, who has served as a Professor of Art at Cal State Long Beach since 1986, is now the subject of a 20 year survey at the Triton Museum of Art in Santa Clara. Cretara is a representational artist with a commitment to the human figure and a straightforward credo: "I paint and draw about my own life experiences as an artist and as a family man." 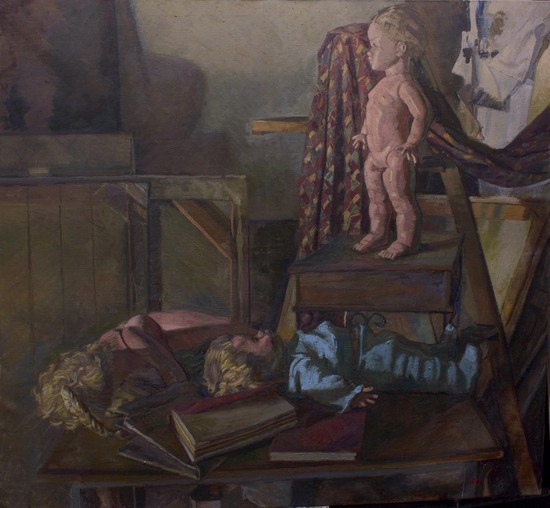 The catalog for his Triton exhibition divides his works into several prominent themes: Doll Paintings, Family, Gender Roles and An Italo-American Life. A narrative painter who comes from the heart, Cretara's work fuses the personal with the theatrical, and channels emotions ranging from nostalgia to tenderness to indignation. Cretara is a rarity in the world of contemporary painting: a mature representational artist who has stayed the course as the art world has hemmed and hawed. I recently interviewed Dominic Cretara and learned more about his personal history, his themes, and his current work. In 1974 a Fulbright Grant allowed you to spend a year in Florence, and you were also later able to spend time in the Padua and Cassis. How did those years in Europe shape your career as a painter? Having grown up in an Italian-American family culture I had been inspired by Italian painting since childhood. I was an only child and often retreated to an "Italy of the mind" in my imagination. Being there was not quite what I expected. Confronting the work in person I felt that I was communicating directly with the artists, especially with Andrea del Sarto and Pontormo. There was no sense of childhood nostalgia at all. The formal, technical and content ideas were so interwoven, especially in their drawings, that all I could think of was, "I want to work with that level of complexity too." I analyzed, studied and asked the works questions unceasingly. Later in Padua it was Giotto (and Tintoretto in nearby Venice) that taught me about composing narratives. I also have always been deeply interested in late 19th and early 20th century painting, and Cassis (and all of southern France) really sharpened my understanding of the language of Modernism. 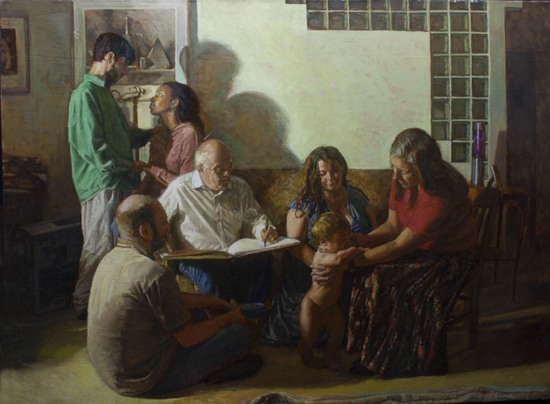 Dominic Cretara, "The Artist's Family," 2006, Oil on Canvas, 46" x 62" Over time, you have developed a personal style that blends Old Master and Modernist influences. Can you tell me more about some of the artists and traditions that have been most important to you? I had known and admired the work of Raphael and Michelangelo since childhood. When I began studying art seriously in my teens I was drawn to Caravaggio and Tintoretto, not only because of the drama but also because of the simplicity and directness of their compositions. In college/art school I fell in love with Goya and French 19th century art (especially Courbet and Couture). I became inspired by Post-Impressionism (especially Cezanne and Seurat as a composer), as well as Modernism (Bonnard, Vuillard, Marquet, down to Balthus). I also discovered German Expressionism and became enthralled with the work of Kokoschka, Beckmann, and Otto Dix. I could see that the possibility of a powerful synthesis between the great Italian tradition and Modernist pictorial language was very relevant to my individual voice as a painter. Most recently I have been inspired by the drawings of R.B. Kitaj, and the paintings of Frank Auerbach, Paula Rego, and Leon Kossoff. 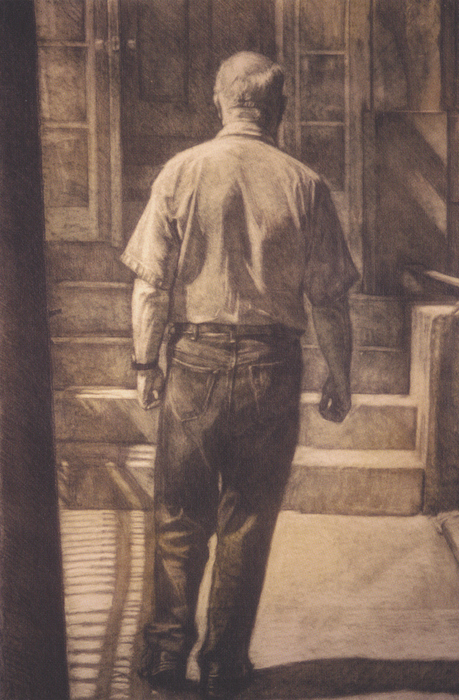 Domenic Cretara, "Going Home," 2005, Pastel and Pencil, 59" x 39" How important is drawing for your work? After forty plus years of painting I know that I am coming to a profound understanding of color. Drawing, however, has always been my great passion and I have come to believe it is synonymous with thinking. It is so powerful, varied, direct, economical and beautiful that I want to do it all the time. I love to draw. Dominic Cretara, "The Forgotten," (Trial of the Century Series), 2002, Mixed Media, 84" x 122" Can you tell me something about the image "The Forgotten" which was part of the series you did on the O. J. Simpson murder trial? The Forgotten was drawn a couple of years after I thought my Trial of the Century Series was finished. I found a brave gallerist, Susan Schomburg, who was willing to exhibit the series, so I did The Forgotten as a return to and a summing up of my feelings and ideas about the case. I had just received my work back from a big exhibition. The paintings were all soft-packed in cardboard - that warm golden surface is so tempting. I began to draw in charcoal and just could not stop. It is meant as a critique of the justice system, but especially as a critical comment on the carnival-like hoopla and temporary celebrity-creating news coverage, which struck me as so awful and typical of our time. The title refers to the victims, especially Ron Goldman; but, also to the ideals of impartial justice that were thrown away. Even here I was involved with art-historical references. On the left I quoted Gustave Dore's illustration for Dante's inferno, the canto about the murderers being submerged in a river of blood with centaurs on shore shooting arrows at them if they lifted their heads above the blood. The idea that the so-called un-deconstructable concept of justice (according to Derrida's late ideas) had been thrown away, made the material of impermanent cardboard packing seem particularly appropriate. 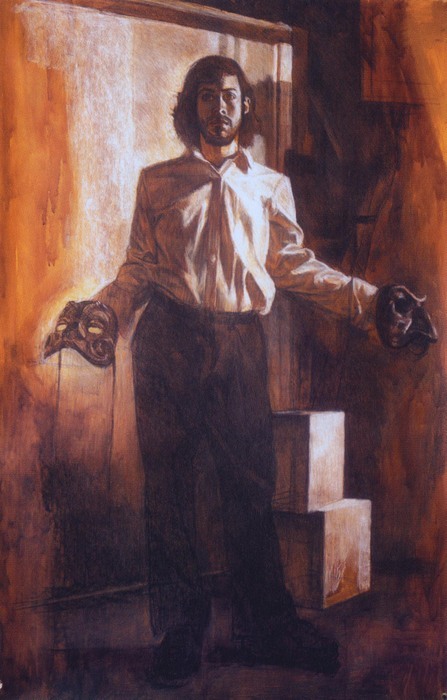 Dominic Cretara, "The Actor," 73" x 44", 2007, Mixed Media, 73" x 44" You have been actively teaching since 1972. How have you evolved as a teacher over the years, and what changes have you noticed in your students? I have always liked what the physicist Richard Feynman said about the connection between teaching and personal creativity. He talks about how having to think and rethink ideas in order to present them clearly to students is helpful to the teacher and pleasurable as well. He also point out that good students ask questions that the teacher wouldn't necessarily have thought of. The answers to these questions can have implications for new discoveries. In short, teaching need not detract from but can add to the creative spirit. Many teachers today say that the advent of video games, social networking, texting, etc. have made it harder to teach distracted students, but I can't say I have noticed any real differences in how students learn. Perhaps I have been unusually fortunate, but I have always had talented, dedicated students who want to learn. I have changed as a teacher over time. I have become a clearer communicator, more tolerant of different ways of learning and painting, and much more patient. 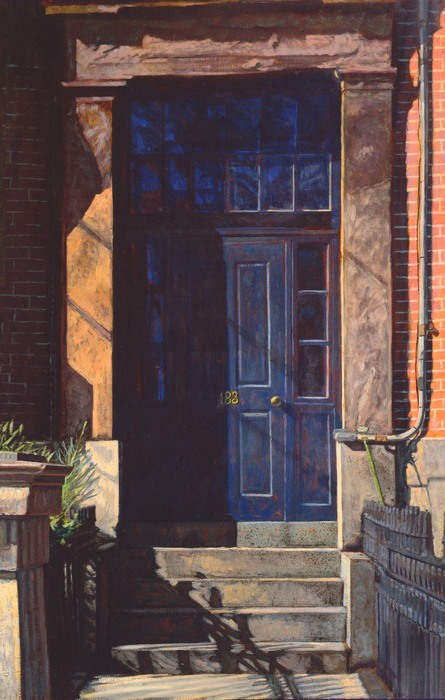 Dominic Cretara, "183 Webster Street," 2000, Oil on Canvas, 84" x 54" What does it feel like to see twenty years of your work brought together? It is highly gratifying, and a little scary. My first reaction was, "Whose work is this?" The work looks completely different in a museum setting with its high walls, beautiful lighting, and thoughtful groupings than it does in the studio. It was as if I saw my works for the first time with something like real objectivity. There are times in an artist's life when that prospect may not be comforting, but this time I felt that I had achieved something substantial. No matter what one's aesthetic predispositions, this is a body of work that says something, and says it powerfully. Dominic Cretara, "Woman and Baby," 2004, Oil on Canvas, 66" x 48" What are you working on now? Dominic Cretara, "Victor," 2011, Oil on Canvas, 60" x 72"
When you visit contemporary art galleries are you seeing work that you like? Any names? 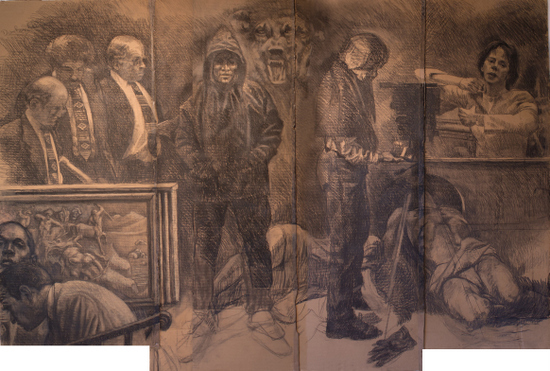 I admire Jerome Witkin's work, especially his drawings. I love Paul Fenniak's paintings. The drawings of Antonio Lopez Garcia move me very deeply. I think Sigmund Abeles and Jack Beal are real contemporary masters. I also greatly admire Hanneline Rogeberg. I like work that can challenge, provoke, disturb, and yet seduce with its beauty.